When it comes to ethnic cookbooks, I think I have more Italian books than any other category. It makes sense. It was the first non-mom food I ever tasted, and I loved it from the first bite. 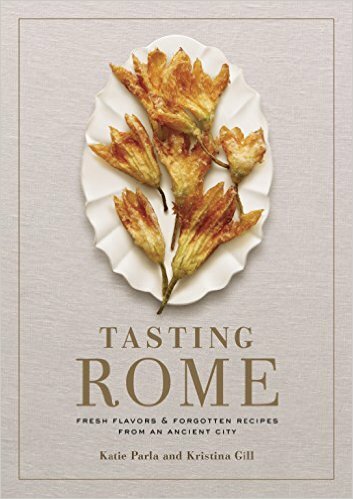 Tasting Rome by Katie Parla and Kristina Gill approaches the subject by including "traditional dishes and contemporary innovations, each selected for the story it tells about Roman cuisine and the way it transports the full spectrum of local flavors to the home kitchen." While the book includes quantities of ingredients, the authors point out that typical Roman cooking doesn't get "bogged down with precise ingredient amounts or proportions." So you're welcome to adjust the recipes to taste while still being true to the spirit of the recipes. Some of the recipes I've bookmarked for later include picchiapo (simmered beef with tomato and onion), concia (fried and marinated zucchini), coda alla vaccinara (braised oxtails), sformatino di broccolo romanesco (romanesco custard) and pizza romano (thin-crust Roman style pizza). What's a little interesting here is the dishes that aren't in the book - no ravioli or lasagna, for example. There are pasta dishes - just not those very common ones. But there is gnocchi. And carbonara. Overall, it's a good book to have in my collection, but I'm glad it's not the only one. I received this book in order to to a review.